Sites of fossilized dinosaurs throughout the Southern seacoast is part of the Tentative list of Republic of Korea in order to qualify for inclusion in the World Heritage List. Our arrival at the Hwangsan-myeon Dinosaur Footprint site near Haenam didn’t exactly promise a great experience – Giant bright green fibreglass dinosaurs marched across the distant lawns surrounded by fibreglass volcanoes. Elsewhere were small blue dinosaurs sitting kangaroo style with happy smiles on their faces and wearing little jackets. This place was clearly being presented as a family theme park. We had driven early from our Hanok guesthouse in Mokpo and were the first tourists of the day as we entered soon after 9 am. And we didn’t see any others during the visit. The site was however, full of teams of ladies manicuring the lawns by hand-weeding and teams of men trimming the “cloud forest” conifers with scissors. (We do not understand the economics of the Korean labour market!). But, despite the place’s obvious “Commercial” aspects, we were given our free “over 64 entry” without question. We ignored the enormous museum up on the hill and set off along a lakeside (once an arm of the sea but now dammed) boardwalk to look for “footprints”. This followed an exposed horizontal sedimentary rock surface which was inclined from left to right under the boardwalk. To the right was a c 5m cliff of un-eroded layers which once covered the now exposed surface upon which the “Dinosaur” tracks were, we hoped, to be found! We quickly found some rather small marks, which the Korean/Englsh signs stated were made by anthropods and crawling creatures plus some web footed “birds”. Small they may have been, but they were definitely “visible”! This was very “hopeful” - our previous attempts around the world to see such footprints had never been particularly successful – the last one at Spain’s, now removed, T List site of “Dinosaur Ichnite sites” yielded just one footprint after a long climb to and from the beach (though Mrs Solivagant still isn’t convinced that it wasn’t just a random mark on the rock!). But, rather ominously, the history of the site ended in 2002 with what was called “Its Tentative list nomination for the World Heritage List by UNESCO”. Of the subsequent failure of the 2009 nomination there was, unsurprisingly, no mention! The boardwalk entered a large covered, glass fronted building about 60 m long and our presence switched on lights and started video presentations. Here there were some indendations on the exposed rock surface described as “Carnivore (Meat eating) dinosaur footprint”. Its carnivorous provenance wasn’t exactly evident but it sounded exciting! The final building was the “Large Dinosaur Hall”. This contained a very impressive series of deep prints, so well preserved that they still contained the shapes made by the creature’s toes impressed in the “mud” (Photo). A notice board claimed that these were “probably unique in the World”. We walked back through the Museum to pick up some literature. It was a “generalised” Dinosaur museum not specifically related to the footprints we had just seen but contained large numbers of fibreglass skeletons presented in dramatic fashion. It was obviously aimed at kids – but none the worse for that. Despite the pleas of the receptionist that we should go see one particular fossil which had been brought from Montana USA we gave it a miss – we still had 3 more Korean TWHS to see that day! All in all we were quite impressed with what we had seen regarding the footprints. However, In 2009, when this site was nominated together with 4 others in Korea, IUCN were most definitely NOT and recommended non-inscription. The arguments for this are in this document on PDF page numbers 12-19 http://whc.unesco.org/archive/2009/whc09-33com-inf8B2e.pdf . IUCN seemed absolutely determined NOT to support the nomination - it clearly didn’t particularly like the idea of sites based solely on footprints (and 2 others from Spain/Portugal and Bolivia were also in the pipeline) when sites with fossils were already on the List (Though the Korean Boseong quarry site is different in that it has egg remains), didn’t agree with Korea’s comparative analysis and concluded that the sites didn’t meet “World” significance (only “Asian”). The receptionist we spoke to seemed to accept that the site wouldn’t ever be inscribed. Whatever – we enjoyed our visit and regard it as one of the highlights of our trip – despite those happy little blue dinosaurs! 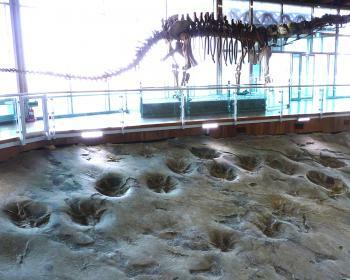 I visited the dinosaur footprints in Goseong. (Right next to a kid-friendly dinosaur museum). Footprints are interesting, but the beauty of the rugged coast is likely the major highlight for most visitors. I was glad I could make out the footprints and trackways; they are easy to spot because the footprints are usually filled with small pools of water, which comes with the change of tide. 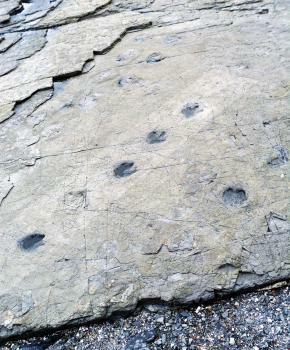 Not only were the footprints fairly easy to make out, it was possible to distinguish different dinosaur species amongst the footprints. As a serial site there are 3-4 other footprint locations along the southern coast. I would certainly be interested in visiting another site, perhaps the site in Uhang-ri near Mokpo. Despite the WHC rejection in 2009, this is a great place to visit. The chances for a newly created nomination dossier in the coming years is perhaps dwindling, yet new paleontological discoveries are ongoing in South Korea. It might not be so unlikely to see a new nomination emerge in a decade or two once more fossil sites have been unearthed.